Warren Buffett has a net worth that is envied by investors worldwide both professional and beginner alike. Buffett's safe and value driven strategy for compounding and reinvesting earnings has secured a fortune in the billions, making him an investment messiah amongst many. Some of Buffett's key techniques for growing wealth are to build multiple income streams, reinvest and compound dividend earnings. Simply put, the financial structure of the insurance industry is what attracts Buffett. While many believe the insurance companies make money from premiums (funds paid by a policyholder on a monthly or annual basis for an insurance policy), the reality is that the true generation of capital comes from the company's insurance float! 'To begin with, float is money we hold but don’t own. In an insurance operation, float arises because premiums are received before losses are paid, an interval that sometimes extends over many years. During that time, the insurer invests the money.' – Warren Buffett/Berkshire Hathaway shareholder letter. Floats are created from the difference between premiums received and claims paid out, which create a reserve of capital for insurance companies to invest with. By implementing value investing with the insurance float, an insurance company can build positions in undervalued stocks, accumulate dividend-paying shares, and reinvest capital back into the company – all potentially before having to pay out any claims. Think of it like as an interest-free loan. Even better, if the insurance company makes a profit underwriting the policy, it’s a negative interest-rate loan! The insurance industry provides a service of protection and will continue to have high demand for the foreseeable future. Even with advancements in technology and efficiency of the sector, any civilized environment will likely require legal protection for businesses, users, and so on. Buffett executed his value investing approach with Berkshire Hathaway and took full advantage of the financial model of insurance companies. Taking advantage of reinvesting Berkshire Hathaway's float has been a large contributor to the huge success he has experienced with the company. 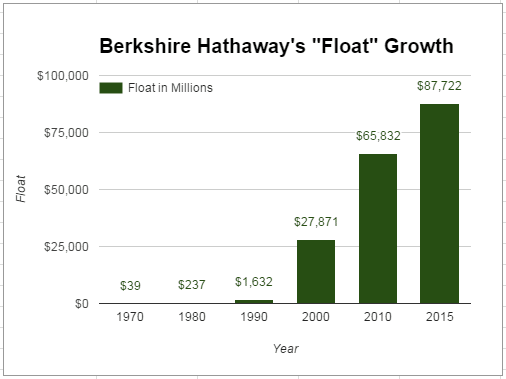 As the image shows above, the float growth has doubled over each decade. Berkshire Hathaway Reinsurance is the biggest subsidiary by float size, followed by vehicle insurer GEICO, which was acquired in 1996. As stated above, legitimate insurance offers legal protection for people and is usually a legal requirement in any country with a well-established law and order system. Regardless of economic conditions, insurance will still be a service that remains in high demand. Utilizing this simple fact and growing the float at low cost, insurance companies can execute a highly profitable investment strategy and reinvest capital into productive use cases. Buffett and Berkshire Hathaway have shown the financial world how effective long-term reinvesting and compounding can truly be. By choosing methods that are nearly recession-proof (at least by consumer demand and payouts), the net worths of the businesses and individuals have grown at a constant rate. JOIN THE RICH: Execute This MASTER PLAN!